I had a great first weekend at post! Saturday, August 1st, is Independence Day here in Benin, so we all knew that we would get to experience the festivities. In addition to Independence Day, Adourékoman was celebrating the 10 year anniversary of the death of one of its Badjagou matriarchs. The day started with a special mass at the Catholic Church in town. The entire Badjagou family (most of the village) was wearing matching tissu. The service was conducted in Idaasha, so I'm glad that I had Fortune and Daniel to translate for me. The choir sang, there was a lot of dancing and Fortune insisted on introducing me publicly to the whole community. We stood in front of hundreds of people and he handed me the mic to greet the crowd. I'm still working to get the Idaasha salutations, but everyone appreciated my efforts. After the service, there was a big luncheon provided by the family and shots of the local brew, Sodabe, were passed around. When I got home, Fortune insisted we drive into Glazoué for Independence Day celebrations. The trip is about 20 minutes down a red dirt road and I'm coming to the conclusion that I will be doing that drive a lot. Our first stop was at a buvette where the other chefs du village were gathered for a party. We joined them for a drink and then stayed to eat some yam pilé, a traditional dish in the Collines. It's an interesting mix between paté and mashed potatoes. When we finally made it back to village, I took a quick bucket bath in my open air shower and crashed for a nap. I woke up and decided to explore the village on my own. I ended up settling in at the Health Center and hanging out with Daniel while he attended to some patients. I played around with a baby who ended up peeing on me (that's twice in two days)... I'm getting used to it. Fortune finally sent his kids to come get me for a dinner of paté. I helped his wife prepare the dinner and an accompanying peanut sauce. By the time everything was ready, I was exhausted. I managed to sneak in a short bucket shower before a rain storm rolled in. I woke up this morning having promised Fortune and Daniel that I would join them at mass. I managed to drink a whole bowl of hot chocolate before running off to Daniel's house. I was informed that mass started at 8 am sharp, but when we rolled in at 8:30, it hadn't even started. Today's service was shorter than yesterday's special mass and there were far fewer attendees. We still got to dance down the aisles and song though. After church, Fortune brought me around to greet more villagers before heading off to Kpakpa to visit Amanda and Nell. 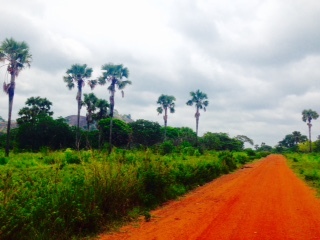 Kpakpa is a small village about 15 minutes away by moto. Amanda, an EA volunteer, will be replacing Nell there after swear in. Cate, another EA volunteer who is only another 15 minutes away, joined us for lunch and we passed away the afternoon catching up on village life. I am eternally grateful that these two ladies are so close and we will get to see each other very regularly. After a relaxing afternoon in Kpakpa, Fortune and I returned to Adourékoman. I left to visit Daniel at the health center and ran into Odette who was just stopping by. Sabine, the other employee at the Health Center, sent over bean soup for lunch, so I will probably reheat that for dinner before being served more paté. Everyone here is taking great care of me and being so welcoming. I'm looking forward to vaccination day at the center tomorrow and getting into the groove of life here. Here's a little taste of my beautiful scenery. Red dirt roads, Collines and palm trees for miles.